^ a b Michigan Legislature (1915) [enacted May 13, 1913]. "Chapter 91: State Reward Trunk Line Highways". In Shields, Edmund C.; Black, Cyrenius P. & Broomfield, Archibald. 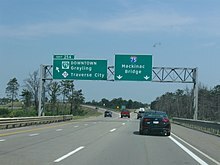 The Compiled Laws of the State of Michigan. Vol. I. Lansing, MI: Wynkoop, Hallenbeck and Crawford, State Printers. pp. 1868–72. OCLC 44724558. Retrieved January 24, 2012 – via Google Books. ^ Dillman, George C. (1920). "Maintenance: Trunk Line Marking". In Rogers, Frank F. Eighth Biennial Report of the State Highway Commissioner (Report). Lansing, MI: Wynkoop, Hallenbeck and Crawford, State Printers. p. 15. OCLC 11888473. Retrieved April 12, 2013 – via Google Books. ^ "Route Renumbering: New Green Markers Will Replace Old Shields". California Highways and Public Works. Vol. 43 no. 3–4. March–April 1964. pp. 11–13. ISSN 0008-1159. OCLC 7511628. Retrieved March 8, 2012 – via Archive.org. ^ Stein, Jason (September 13, 2009). "Detroit: The Place Isn't Quite What It Used To Be". Daily Herald. Arlington Heights, IL. p. 1. OCLC 18030507. Retrieved September 21, 2012. (Subscription required (help)). ^ Belknap, Leslie H. (1920). "Construction". In Rogers, Frank F. Eighth Biennial Report of the State Highway Commissioner (Report). Lansing, MI: Wynkoop, Hallenbeck and Crawford, State Printers. p. 10. OCLC 11888473. Retrieved April 12, 2013 – via Google Books. ^ Michigan Legislature (1919) [enacted March 18, 1919]. "PA 19: An Act to Provide for the Construction, Improvement and Maintenance of Trunk Line Highways". In Vaughn, Coleman C. Public Acts of the Legislature of the State of Michigan Passed at the Regular Session of 1919 Containing Joint Resolutions and Amendments to the Constitution. Fort Wayne, IN: Fort Wayne Printing. pp. 31–35. ISSN 0893-2573. OCLC 1757300. Retrieved October 10, 2013 – via Google Books. ^ "The Cracks are Showing". The Economist. Vol. 387 no. 8586 (US ed.). June 26, 2008. ISSN 0013-0613. OCLC 181819241. Retrieved October 23, 2008. (Subscription required (help)). ^ Brown, Warren (February 4, 1990). 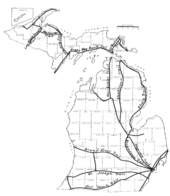 "Home of the American Auto Finds Reuther Freeway a Mixed Blessing". The Washington Post. p. H2. ISSN 0740-5421. OCLC 9965758. Retrieved July 13, 2012. (Subscription required (help)). This page was last edited on 22 February 2019, at 19:48 (UTC).